Assault Publishing is having themselves a sale on their sci-fi items over in their webshop. The celebrating of 3rd birthday of Assault Publishing continues! 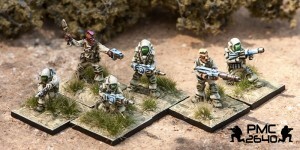 This time you can get the special 15% discount on nearly all Sci-Fi wargame articles in Assault Publishing store: PMC 2640 printed rulebooks (but not e-books) and Assault Publishing 15mm miniatures (APDS), O8 miniatures, APCR re-packs (O8, Rebel Minis, Antenocitis Workshop, Brigade Models, even remaining Cannon Fodder starters) and all 15mm HEAT terrain range! More details on the Assault Publishing web page.